When the Titanic sank on April 15, 1912, Audubon Park had barely completed the first phase of its rapid transformation from a “residential park” to a cityscape and the Hemlocks, the Grinnell family residence that once occupied the Riverside Drive block front between 156th and 157th Streets had been gone only a couple of years, its demolition making way for the Riviera, the thirteen-story apartment building numbered 790 Riverside Drive. Although the Grinnell family had called the Hemlocks “home” for five decades, they were not the first family to live there. When the Audubon brothers, Victor and John Woodhouse, first built the house in 1851, they first leased it to merchant Samuel R. Downer, who lived there until about 1856. When Downer moved his family from the Park, the Audubons leased the house to Henry Ward Johnson, an average adjuster and founding partner (with A. Foster Higgins) of the marine insurance company Johnson & Higgins, a company that is still in business more than one hundred and fifty years later. Henry Ward Johnson died in 1881, but the company he and Higgins founded continued to prosper under their names and thirty years after Johnson’s death, it insured the maiden voyage of the Titanic, a ship that needs no introduction, particularly not on the centennial of its sinking. 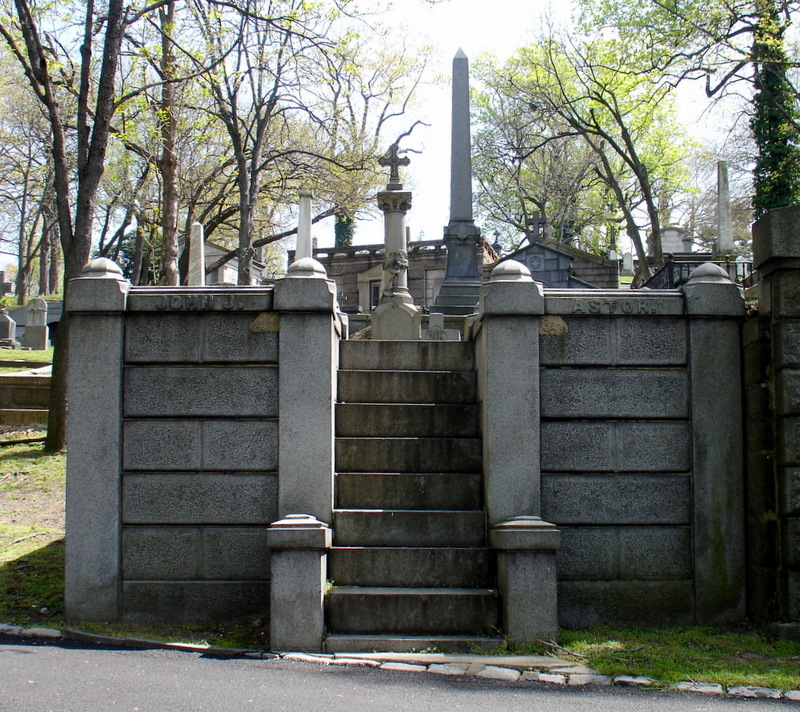 Johnson had moved from Audubon Park around 1860 and was living in Connecticut when he died in 1881, but he was buried in a plot in Trinity Cemetery on the southern border of Audubon Park, high on the hill in the cemetery’s western division, at that time within sight of the house he had once occupied. The plot already contained the remains of Johnson’s two sons, Ward, who died an infant while the family was living in Audubon Park, and Henry Ward Johnson, Jr. who had died in 1871 at the age of twenty-four. 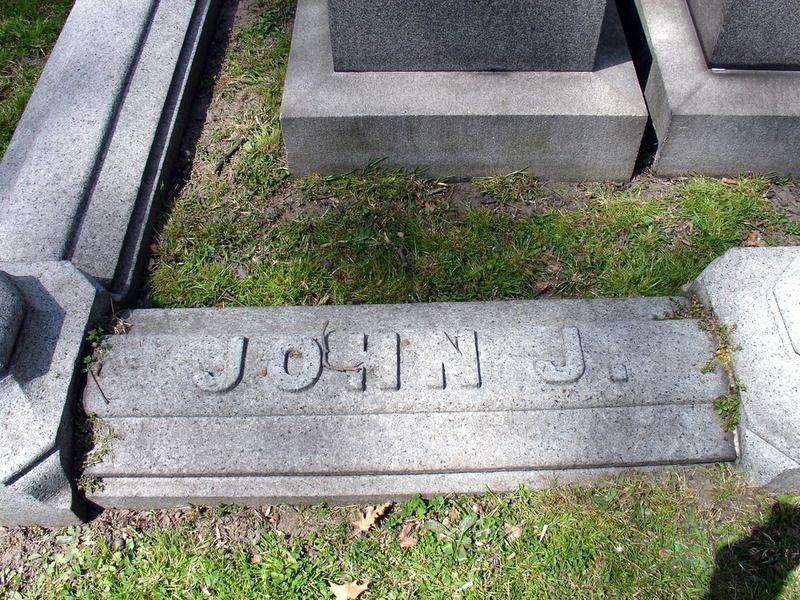 Later, Johnson’s wife and daughter would also be interred in the family plot. 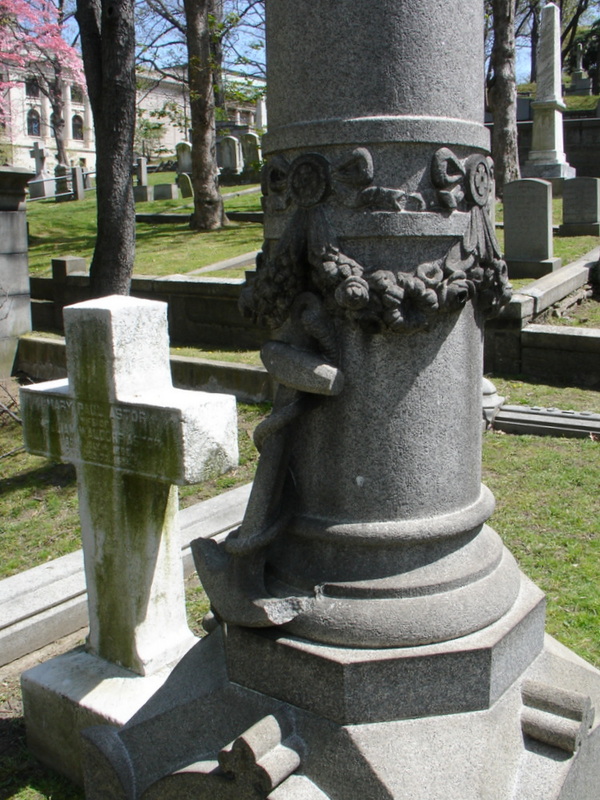 Visible from the Johnson plot, perhaps twenty yards down the hill, is the tombstone of John Jacob Astor IV, the richest passenger on the Titanic and the only fatality of that ship’s disaster buried in Manhattan. In 1909, Astor had created a scandal in society when he divorced his wife Ava Lowle Willing and, at the age of forty-seven, married 18-year-old Madeleine Talmage Force, who was a year younger than his son Vincent. Escaping society’s glare and waiting for the turmoil to die down, Astor took his bride on an extended tour of Europe, traveling part of the time with American Margaret Brown, later memorialized as “The Unsinkable Molly Brown.” When the young Mrs. Astor realized she was pregnant, she and Astor agreed that they wanted their child born in America, so they made reservations to return to New York on the maiden voyage of the Titanic. The evening the Titanic struck an iceberg, Astor accompanied his wife, her maid Rosalie Birdsie, and her nurse to the deck where he helped put them in Lifeboat Number 4. He asked if he might accompany his wife because of her condition, but when the officer in charge told him that no men could leave the ship until all women and children were evacuated, he stepped back. Astor and his valet went down with the ship. Over the next few weeks, numerous articles in newspapers around the country mentioned Astor’s valor, several women coming forward to commend his bravery, particularly Mrs. Ida Hipach and her daughter, who reported that but for Astor’s calm command, they would not have been put in a lifeboat at all. Astor’s was among the 333 bodies reclaimed from the sea, recovered by the Mackay-Bennett on April 22, 1912, but not identified until several days later. 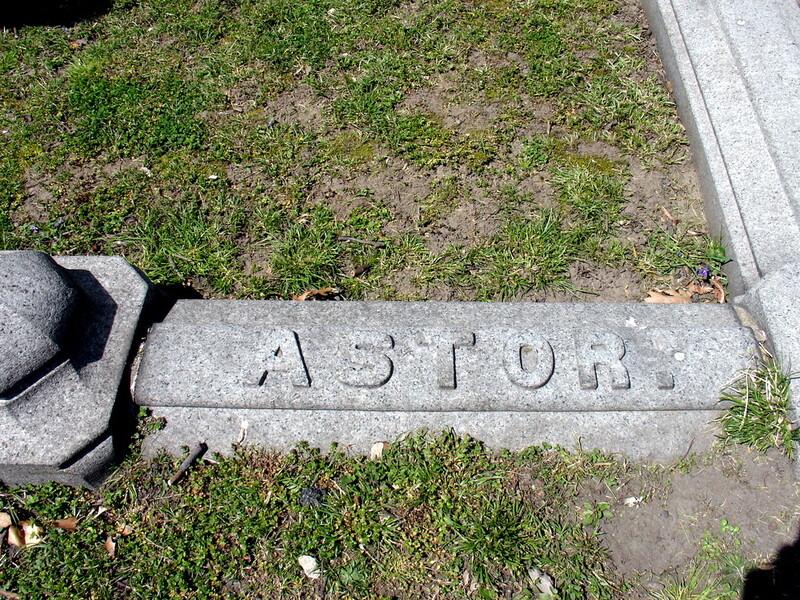 Some witnesses reported that his body was bruised and mangled, possibly from a falling smokestack, but the mortician who prepared Astor for burial disputed that claim and reported that the body was undamaged. Though Astor’s funeral was confined to family and invited guests, it drew a large crowd of observers, some no doubt touched by the stories of his bravery; others curious to see the funeral of one of the richest men in America or to catch a glimpse of his teen-age bride. The funeral service itself took place on Saturday, May 3, near Ferncliffe, the Astor estate, in the Church of the Messiah in Rhinecliff-on-the-Hudson, where Astor had served many years as Senior Warden on the Vestry. The list of honorary pallbearers and invited guests was a veritable who’s-who of New York’s wealthiest citizens. Afterwards, the pall bearers loaded the coffin—covered with lavender orchids—onto a train, and then the family, clergy, and guests boarded for the trip down the river along the Hudson River Railroad tracks to the station at 158th Street. There, according to a New York Timesarticle (May 4, 1912), a twelve-man police squad from the 152ndStreet station met the train and escorted the cortege (a hearse and four carriages) the few blocks south to Trinity Cemetery for the interment service. The funeral cortege entering the cemetery. The vacant building lot at left is the site of 780 Riverside Drive, the Vauxhall. After a brief graveside service, Astor’s coffin was placed in the vault with his father, just a few feet away from a separate vault containing the remains of his great-grandfather, the first John Jacob Astor. The story did not end there, though. The press eagerly followed Mrs. Astor’s health, the birth of her baby, and the dispursement of Astor’s estate, supplying details for an interested reading public. Astor’s name resurfaced during the inquiries into the disaster, and he has inhabited the many stories, books, and films about the Titanic and its doomed voyage. As long as the Titanic’s story survives, so will the memory and gallantry of John Jacob Astor IV. During the fifteen years I’ve been researching and writing about Audubon Park, I’ve had many moments of coincidence when a fact or name would suddenly appear in a new context and illuminate another bit of information that had previously seemed completely unrelated. Oddly—or perhaps not—these moments often occur in the quiet of a cemetery, where a date, a name, or even a place of birth will suddenly jump off a tombstone and bring an “a-ha” moment. 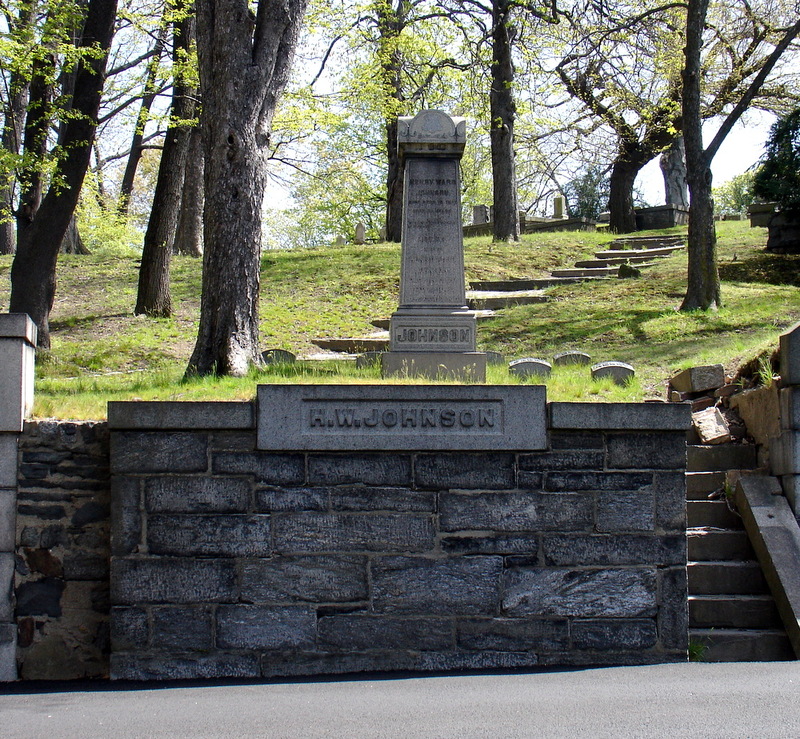 In April 2012, when I walked the two blocks south from my apartment building to Trinity Cemetery, my purpose was to photograph John Jacob Astor’s tomb, so that I’d have a few pictures to accompany a blog relating the sole fatality of the Titanic buried in Manhattan with the neighboring Audubon Park Historic District. After taking pictures, I walked up the hill in the western division to admire the pink dogwood, the sole remaining specimen of what reportedly were once hundreds in the neighborhood. Then, as I often do, I walked about a bit, casually looking at tombstones and checking names in case any are familiar. Only a few feet from the dogwood, I spotted H. W. Johnson, a name I hadn’t noticed in the cemetery before, but that I had run across long ago in George Bird Grinnell’s Memoirs. Since I knew that Johnson had moved from Audubon Park before 1860, I hadn’t suspected he would be buried in Trinity Cemetery, but as I soon learned from the tombstone, in 1857 while the Johnsons lived in the Park, their infant son died, so they must have purchased the plot in Trinity Cemetery and made their own burial plans then. Back home, I checked my database and found that I had entries from New York City Directories for “average adjuster” H. W. Johnson and his company Johnson & Higgins. A quick google brought up several websites with information about the company, the first of which began, “What do the Titanic, Boeing jets, the racehorse Secretariat’s bloodline, and industrialist Andrew Mellon’s business properties have in common? At one time or another in its 150-year history, Johnson & Higgins brokered the insurance coverage for each of these disparate entities.” The coincidence took my breath away. Granted Johnson was long dead when his company insured the Titanic, but what an interesting bit of trivia that from the gravesite of the founder of the company that insured the Titanic you can look down the hill and see the gravesite of the one Titanic fatality buried in Manhattan, the galant Mr. Astor. Cemetery ciphers can be as fascinating as they are enlightening. Posted in Audubon Park Historic District, Henry Ward Johnson, John Jacob Astor IV, Johnson and Higgins, Titanic, Trinity Cemetery. Bookmark the permalink. 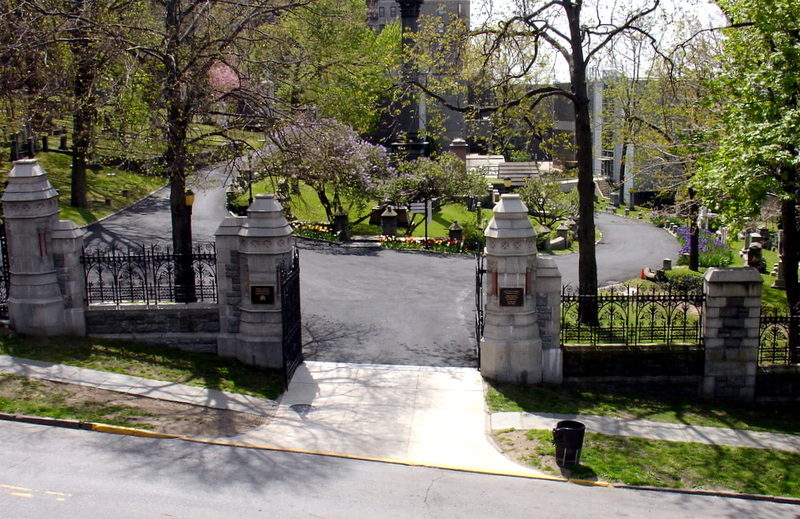 Maybe when I am in NYC next March you can take me on a tour of Trinity Cemetery. I was there once in 2000 but did not get to see much due to a lack of time. Wonderful story, Matthew, as usual. I envy you living where you do and being able to take your walks through history, right from your door. What a delightful article and as always, well documented and well written. I look forward to them and share them. LOVE living in such a rich historical area. Thanks! Where Better to Spend Audubon’s 227th Birthday than His Former Home in Northern Manhattan?